Add a little twinkle to your toes with a pair of statement sneakers. 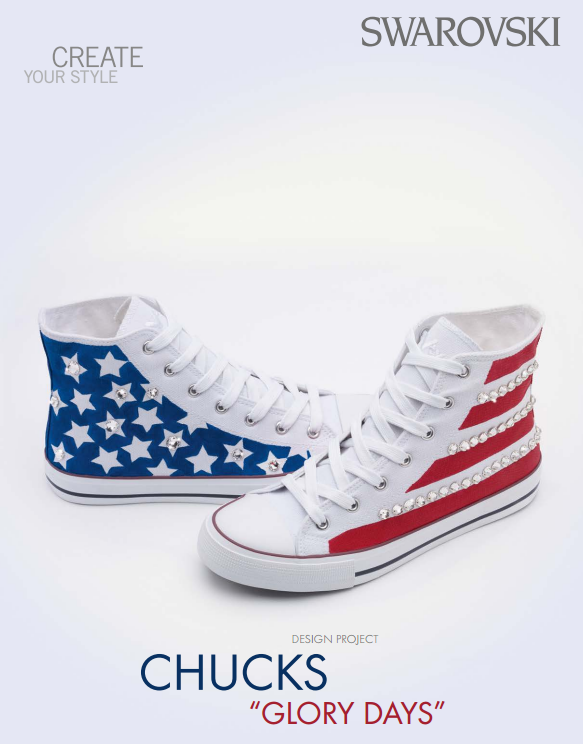 Finish off your high-tops with eye-catching Swarovski crystals sewn on to patriotic red, white and blue for some extra Fourth of July sparkle. And when Independence Day celebrations are over, wear them to make every day a dazzle day! White sewing thread, red and blue fabric paint. Carboard, 3x3cm Paint brush, a pencil, a ruler, scissors and a sewing needle. STEP 1: Use our pattern or draw a 2cm star onto a cardboard as shown in our illustrations with this step. 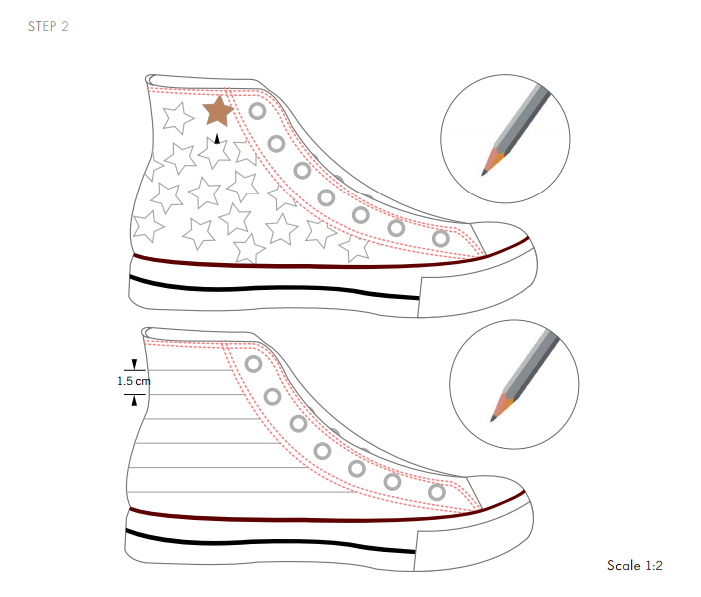 STEP 2: Use the cardboard star template and a pencil to draw stars all around one of the shoes. 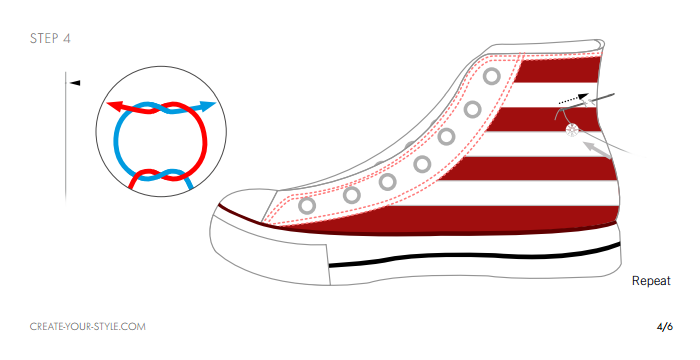 Draw horizontal lines around the other shoe with a pencil to make 1.5cm wide stripes. 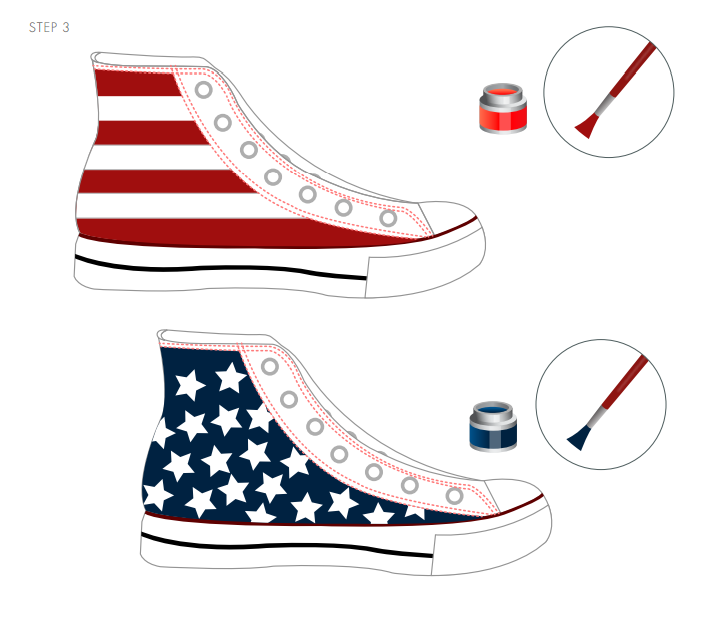 STEP 3: Paint the horizontal stripes on the one shoe in red and the background around the stars of the other shoe in blue. STEP 4: Tie a double knot onto a sewing thread and sew Swarovski Sew-on Stones 3288 8mm Crystal on top of the red stripes. (Do not pierce through to the inside of the shoe with the needle and thread). Repeat the steps with the horizontal rows and the stars as shown in the illustration and material list. 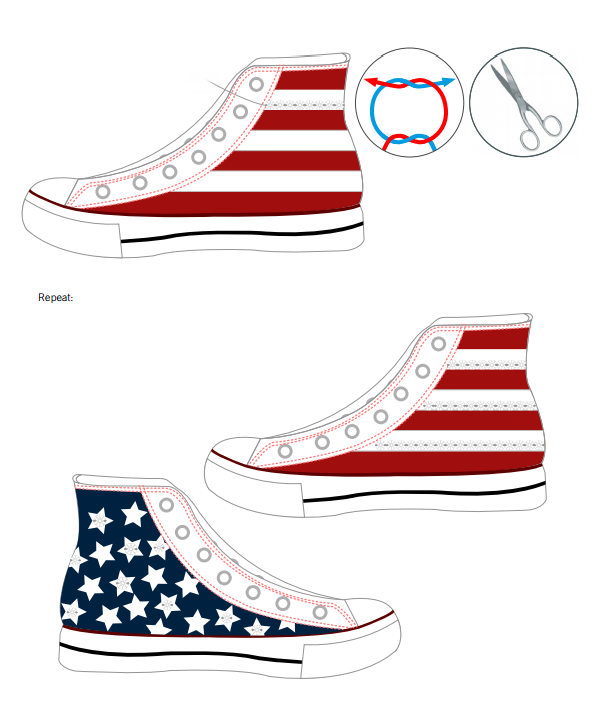 This entry was posted in DIY and Resources and tagged 4th of July DIY Crafts, cheap crystals, DIY crystal designs, DIY Swarovski Crafty projects, DIY Swarovski Crystal Chuck Taylor sneakers, DIY Swarovski Crystal high-top sneakers, DIY Swarovski Crystal shoes, extra Fourth of July sparkle, Get Your Crafty Kicks On This 4th of July & Celebrate CHUCKS "GLORY DAYS", Rainbows of Light, red, Sew Swarovski Crystals onto shoes, Swarovski 3288 - 10mm Crystal Sew-on Stones, Swarovski 3288 - 8mm Crystal Sew-on Stones, Swarovski Crystal high-tops, Swarovski Crystal Sew On Stones, Swarovski Crystals Wholesale to the public, Swarovski Wholesale Beads, white and blue crystal designs, wholesale crystals, wholesale swarovski crystals. Bookmark the permalink. ← Create A Star-Studded Bracelet That Will Have You Shining Extra Bright This 4th of July!